Saturn transit from Scorpio to Sagittarius on 26th January 2017. Saturn leaves your 12th house and will be in Ascendant till next transit (till 24th January 2020). From the 1st house, Saturn aspects your 3rd, 7th and 10th house. 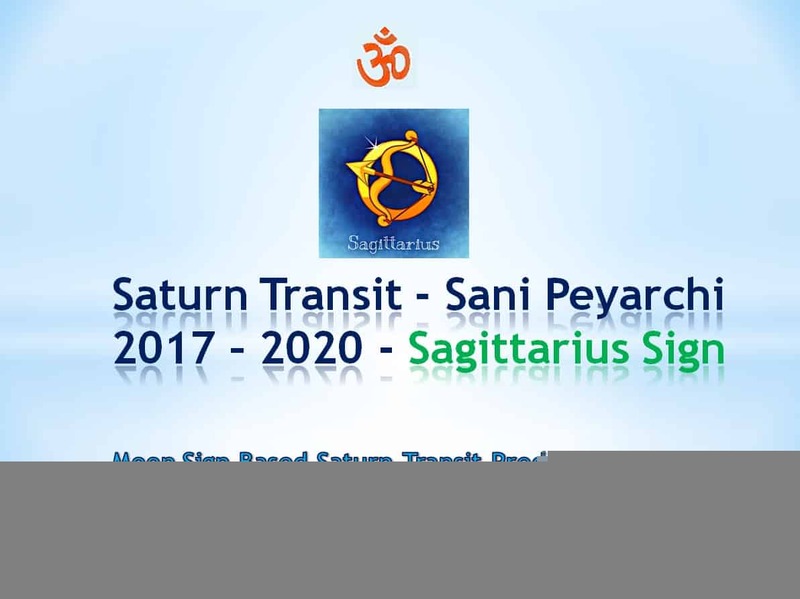 Saturn Transit 2017 effects on Sagittarius: Till now, the presence of Planet Saturn in your 12th House, which deals which the expenses, had given you various unnecessary expenditures in terms of your health, business and losses. Now, the transition of Saturn to your Birth Sign, called as Jemma Sani, will result in lessening of such expenses. The presence of Saturn in your Birth Sign will give you mixed outcomes. As your finances get sorted this time of the year, you can heave a sigh of relief. Though you might face a lot of troubles in your life, you can see good results reaching you unexpectedly. You might face unnecessary traveling. The outcome of such travels will be mixed. You should be careful with your words. Money flow will be quite good, and your expenses will increase accordingly. You must try to reign in your words and focus only on your work. After Saturn transit to Sagittarius Sign, You might not get paid to the amount of work you had done. Troubles in the form of close relatives might come and go. Your siblings will prove to be a mixed bag of help and difficulty. Good news might be delayed. Your interest in learning new things will be low. Kindly take care of your mother’s health. Though you might buy properties in the beginning of this year, you might have to forgo them in later time. Some will sell off their old properties and buy new ones. Your attempts at higher studies might not be fruitful. So put all your efforts and concentration in your studies. Some might get the chance of shifting their house, job and location to their favor. Be alert while driving. Think clearly, thoroughly through any decision and do not get confused. Your interest in partying and celebrations will be quite low. This Saturn transit to Sagittarius Sign will bring happy celebrations in your family. New members bring joy and happiness to your household. Take your meals in time. Those who are struggling with unemployment will get a job after many trials and tribulations. Though the job might not be up to your expectations, hold on to that job. You will get loans easily. You might have to stave off your old loans by getting new loans. Do not lend your money to others, as the money might not return to you in time. Based on your current Dasa and Bhukti(Subperiod) the effect of this Saturn transit for Sagittarius sign will change.